Pragues newest trendy hostel.located in the charming and lively art-noveau district of zizkov,well known for its dense network of traditional pubs,cosy bars and cool clubs. We welcome you to come stay with us in the heart of Prague's city center. We are located 10 minutes away from the Main Train Station,and 2 minutes walk from Wenceslas Square. The whole city will be just a walk away from your bed. Experience our friendly atmosphere and stay at an ideal meeting place for travellers in the middle of Prague. 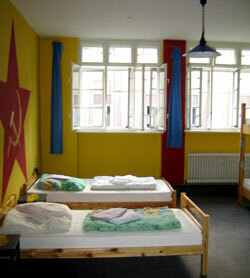 We opened this place with the intention of offering above standard services at hostel prices. Our apartments are ensuite, all have a fully equipped kitchen and a cable TV. We have limitless hot showers here, towels at your disposal for free, sheets included, free breakfast and free high speed internet. No curfews or lockout rules for our guests. A complimentary city map will be offered to you upon arrival, as well as a short introduction to the city and coupons for discount meals in few places in the neighbourhood. We offer various other discounts for walking and bike tours of the city, and other activities around town. For the nightlifers: there are great bars very close to the house: cellar labyrinth with wine-beer-and-absinth bar just next door (easy to crawl to bed from), dance bars close by, Rock Cafe around the corner - great concerts, Radost FX two stops by tram (house and dance parties), Roxy five stops away, Old Town bars and clubs and Jazz clubs just a 10 minute walk away!! Reception for check-ins is open 24h!! !